The lack of sufficient sleep can cause other symptoms in return. People who sleep insufficiently wake up feeling exhausted and cannot function properly during the day. This may cause troubles in focusing on the daily tasks that normally seem easy when rested. Feeling exhausted and unable to finish the tasks can also lead to anxiety, irritability and even depression. People who constantly suffer from insomnia are at risk of developing severe depression. The sleep deprivation can cause many other symptoms too. If you are suffering from insomnia, it is very likely that you will wake up feeling not well-rested and maintain that feeling throughout the entire day. Insomnia can also have negative effects on the daily activities you normally perform. This is not only uncomfortable, but dangerous too. Suffering from sleeping deprivation makes it difficult for people to drive because they have drowsy sensation. Driver sleepiness is actually responsible for a grand number of car crash injuries. Additionally, older women who suffer from this condition are known to have increased risk of falling down. If this condition happens often and affects your life, you should immediately talk with a doctor. 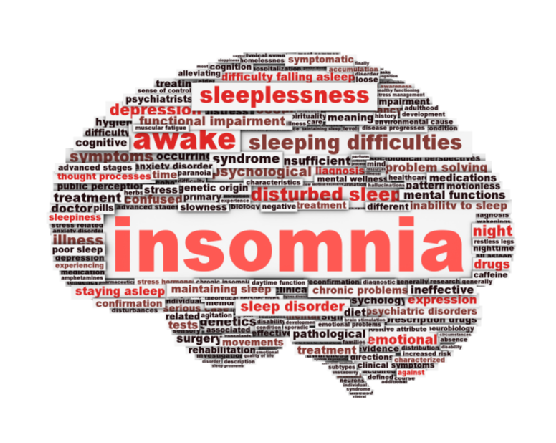 A proper insomnia treatment is focused on avoiding insomnia symptoms and other related problems. Additionally, the chance of this being symptom of other medical problems is still present. It is crucial to determine what the problem is and find a way to treat them in order to improve your overall health. Symptoms of insomnia vary between different cases. There are people who suffer from severe insomnia symptoms, while others have difficulties sleeping sometimes. Severe symptoms include the inability to fall asleep for long periods of time and this is an often-occurring symptom. In the cases of mild or moderate insomnia, a person may not have difficulty falling asleep, but can feel tired when they wake up. Some people find it difficult to fall asleep and lie in bed for hours, watching the time pass by. If this goes on for long periods, it can lead to some serious sleep deprivation. This, of course, leaves negative impact on the daily activities of that person. Another type of insomnia is when people find it easy to fall asleep, but cannot stay asleep long enough. This restlessness leads to bad sleeping habits and inadequate rest, which later results in problems with functioning during the day. There are many cases where patients complained about sleep disturbance of this type. People can also be able to fall asleep, but the signs of insomnia show up after a while. These cases cannot stay asleep for long and wake at 3 or 4 a.m. Despite the feeling of being exhausted, they cannot go back to sleep, no matter how long they try. Some people sleep throughout the whole night and do not have troubles with waking multiple times or waking early. They do not even find falling asleep to be a difficulty. However, these people do not feel rested when they wake. This is also known as insomnia because the reason behind this is their light sleep. The sleep of these patients is filled with disturbances that interrupt the sleeping stages. In order for the body to be properly rested, it needs periods of deep sleep. Insomnia patients express daytime tiredness and sleepiness. Fatigue is yet another symptom that is caused by this condition. Therefore, these people often turn to caffeine intake in order to get through the day and fulfill all daily tasks. This can only worsen the sleeping problems and the entire insomnia condition they already suffer from. This is why it is highly recommended to avoid caffeine if you are suffering from this chronic condition. Chronic insomnia leads to mental sluggishness and decrease in functioning. When people do not sleep properly and sufficiently, they find it quite difficult to focus on even the simplest daily tasks. Chronic lack of sleep causes difficulty in performing daily activities such as going to work, working and taking care of the kids. This often leads to anxiety and in some cases, even depression. This particular insomnia state is known to have very bad effects on the work and school performance. When a person suffers from this disorder, it often takes them a minimum of 30 minutes to fall asleep. Even if they do manage to fall asleep, patients often get only six or fewer hours of sleep. If this is something that is often happening to you, the right thing to do is consult a doctor. The doctor can help you determine the cause of the disorder and help you answer your concerns on how to treat insomnia symptoms. It is normal to experience insomnia once in a while, especially when the main cause for it is stress. All of us feel too stressed to relax and fall asleep sometimes. However, if this persists to be the case and you find it difficult to fall asleep multiple times in a row, you are probably suffering from insomnia. Luckily, there are many ways to treat insomnia, including both medical and home treatment. In mild insomnia cases, people have managed to overcome this condition by simply making certain lifestyle and diet changes.